The new Type 506 is a very rare thing, combining the history of an iconic motorcycle design with luxurious craftsmanship and cutting-edge electric motorcycle technologies. All delivered with Čezeta's tradition for sustainable high-quality engineering. 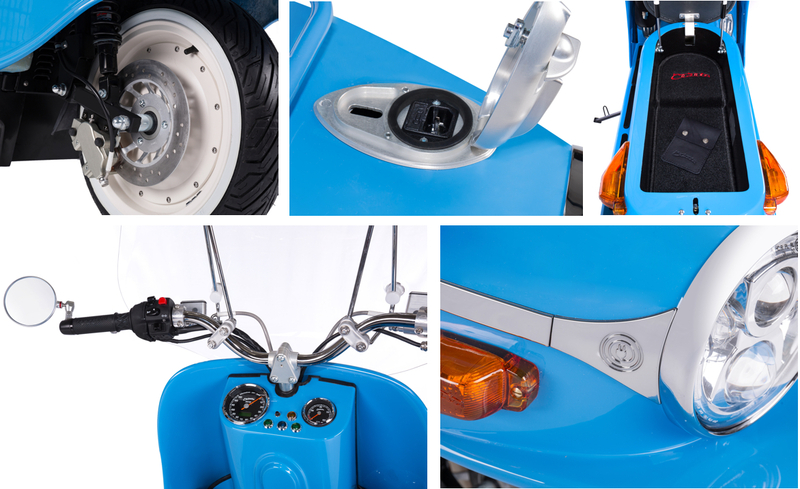 The giant Panasonic® Lithium battery pack gives a TUV-certified range among the best in the world for an electric scooter. A powerful on-board universal charger (110V-240V) allows fast-charging from any household socket. All operations are protected by Čezeta's own computer systems for maximum convenience and safety. 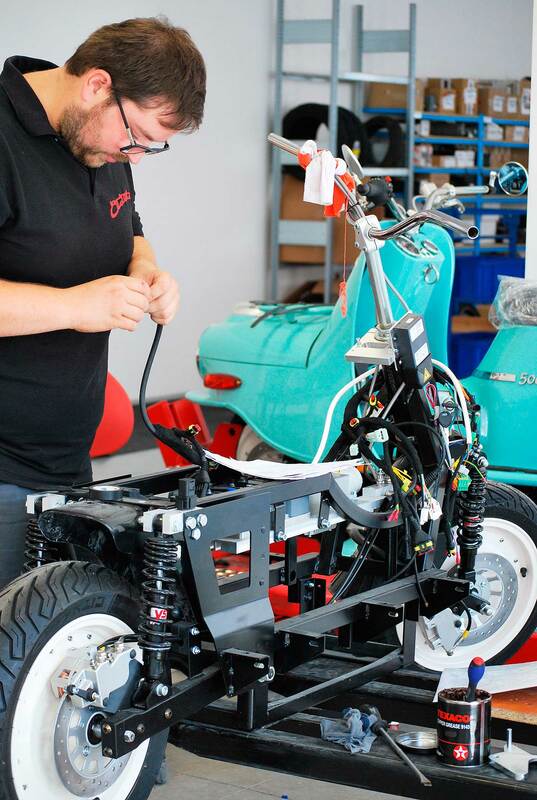 The 11kW hub motor delivers the torque of a sports bike making the 506 one of the world's fastest electric scooters. The unique 'sway' throttle, profile selector and outstanding braking systems ensure the ride is perfectly blended into one seamless confidence-inspiring experience. 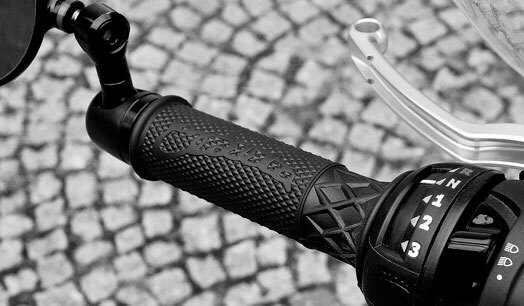 Designed, manufactured and assembled in the Czech Republic according to Čezeta's legendary reputation for outstanding quality and completed using the best European components from companies such as Sevcon, Rizoma and Beringer. Class A1 (equivalent to a 125cc scooter), can be ridden without taking full motorcycle licence depending on local laws. 506/01 nominal 5.7kW / boost 8kW offers acceleration 0-50 km/h in 4.5 seconds and top speed of 85km/h (equivalent to a 125cc scooter). 506/02 nominal 9.2kW / boost 11kW offers acceleration 0-50 km/h in just 2.7 seconds and top speed of 120 km/h (equivalent to a 250cc scooter). Čezeta battery pack uses the proven high performance Panasonic 18650 cells (same as Tesla) integrated with the Čezeta Battery Management System. The 506/01 features a 4kWh capacity pack with a nominal voltage of 84V offering a typical range of 80 km -100 km. The 506/02 features the 50% larger 6kWh pack with a nominal voltage of 84V offering a typical range of 120 km -150 km. The Čezeta's flowing contours originated with the aerodynamics of the 1950s as a testament to the 'space age' aesthetics of the time. 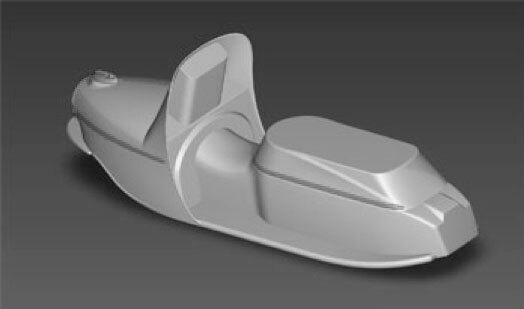 The new Type 506 adapts to a composite bodyshell and frame and despite being big, the whole scooter weighs only 137kg. The 506's instrumentation is simple and classic. 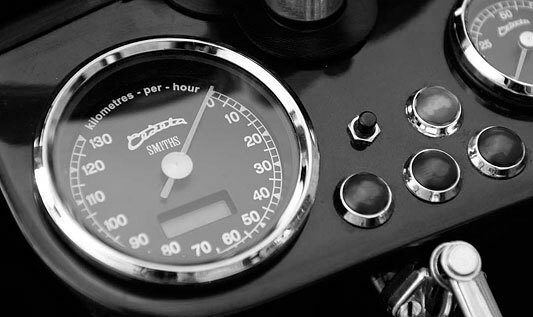 Produced by legendary UK manufacturer 'Smiths' and reminiscent of the original 1950s Čezeta dials, the two bespoke gauges measure speed, trip and battery power and are in classic white decal, finished with chromed bezels. 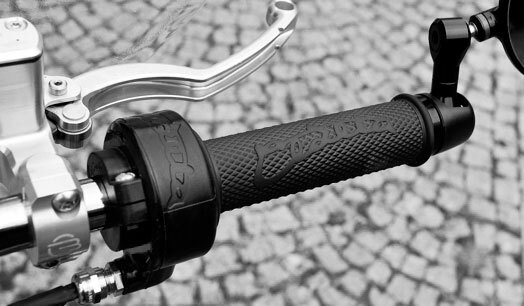 Designed and manufactured by Čezeta, the Powergrip™ is handlebar mounted and provides a choice of three motor profiles that regulate power, acting like digital gears. There is no complication with changing power, switching is simply a matter of rotating the grip. There's even a reverse gear to make moving the Čezeta easy in all directions. Another patented innovation by Čezeta, this is the best way to precisely control a motorcycle. Roll it back as usual to accelerate - but also roll it forward to brake and recuperate energy back to the battery. The swaying motion of your arm in use gave the inspiration for its name. 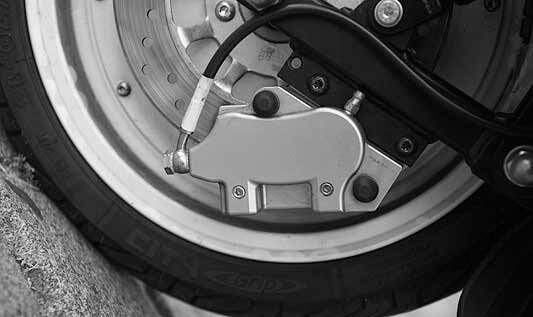 Developed especially to take advantage of the Type 506's leading-links fork and rear hub motor, the all-round hydraulic braking system has outstanding stopping power. You can safely brake from 50km/h to zero in approx 8 metres - significantly more effective than an average motorcycle. And you might notice something cute about the design of the caliper... oink! Čezeta builds in very low volume because we want the value of your 506 to increase not decrease. 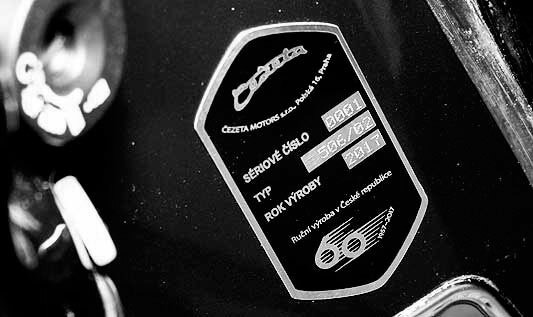 Each is marked with this special "60th Anniversary" plate as a recognition of their historic value in Čezeta's history, being our first electric motorcycle. Designed exclusively for automobile use, the 506's powerful 1.8kW on-board charger can add 42km per hour of charging. It works with every common household socket anywhere in the world. An optional adapter allows connection to 'Type 2' charging stations and our advanced electronic controls ensure its optimal charging of our battery pack. Famous for its car-like storage, the Type 506 has lots of storage options. There's a locked carpet-lined storage box accessible under the seat, a front rack (which can carry up to 15kg) and a leather wine bottle holder behind the legshield. 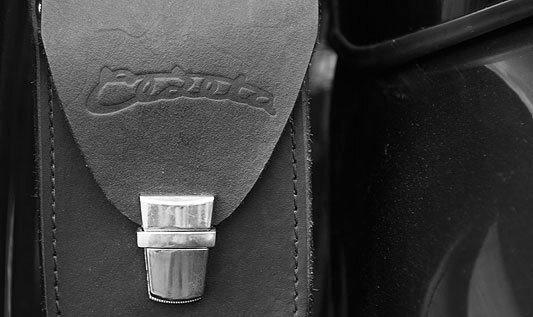 Leather bags, trailers and other accessories are planned in the near future. Our factory is in the Czech Republic and where possible our parts are manufactured locally or in the EU. We invest in training young people in technologies and skills that will be useful for their future and ours. Your support for Čezeta is support for our work to build a sustainable future. The most common enquiries are answered below. 1. Where can I buy a Čezeta 506? We have a small stock of 506 for sale and accept custom orders from this website's configurator. See the 'Buy' page for more details. Typically build and delivery can take 2-3 months. 2. Where do you deliver to? The 506 has EU homologation and is road legal in all EU countries and Switzerland. We can deliver to other countries, subject to some conditions regarding registration and after-sales service. 3. What is the warranty? The Type 506 is supplied with a Standard warranty of 2-years / 40,000 km (506/01 and 506/02), or an optional Extended warranty of 5-years / 80,000 km (506/01) or 5-years / 100,000 km (506/02). 4. What maintenance is required? An electric motorcycle requires no oil changes, fuel filters, spark plugs or emission checks. Instead we offer an optional annual Maintenance Inspection of your vehicle with an Authorised Partner (where available) who will implement any available upgrades that improve your Čezeta. 5. What licence do I need? The Type 506 is in European class "L3e-A1" (up to 11 kW power). It is possible to ride it with a car licence in the Czech Republic, Slovakia, and several other European states. Other countries like Austria, France and the UK require a 1-day basic training course without test. Each country has its own conditions and if in doubt please contact your local driving authorities. In the EU, insurance is done in the same way as with any other vehicle, and available from all major providers. It is usually cheap, for example the current year insurance cost in the Czech Republic is the equivalent of €150 per year, depending on age and history. 7. Can I ride on the motorway? Yes, with your A1 licence. 8. How much does it cost to run? It costs €0.80 for 100km, about 1/10th of the cost of running a diesel car. It's probably the cheapest way to travel around apart from a bicycle. 8. How do I charge the scooter? 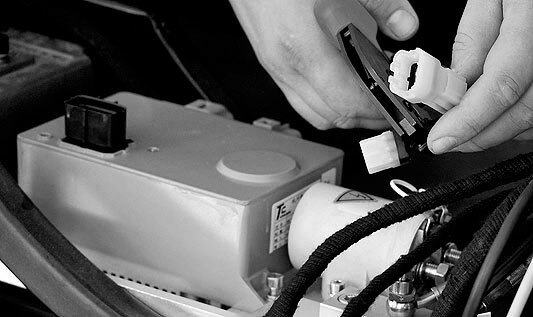 Plug in the charging cable provided into the scooter's on-board charger and the other end into any standard 120-240V household socket. Charging is completely automatic, and will stop when charging is completed. 9. How long does it take to charge the battery pack? It charges at a rate of 42 km per hour from a domestic 220-240v socket. Lower voltages will be proportionally slower. 10. How do I know when to charge the battery pack? There is a meter in the instrument panel that reads just like a petrol gauge. If you are running low, a warning light will flash and we recommend you switch to the slowest mode. 11. Are the batteries safe? The battery pack uses Panasonic 18650 Li-ion cells (the same cells as used by Tesla), proven safe and recyclable cells with long lifetimes when properly operated. 12. How big is the battery pack? You have a choice of 4 kWh or 6 kWh. The smaller is good for approx 100km in the city, the larger for approx 150km. 13. What is the certified ranges of the battery packs? The Type 506/01 has TUV EU-homologation tested range of 80km, a top speed of 85 km/h and acceleration 0-50km/h of 4.3 seconds. The Type 506/02 has a tested range of 130km, a top speed of 120 km/h and acceleration 0-50 km/h in 2.3 seconds. Their performance is roughly equivalent to old petrol 125cc or 250cc scooters. 14. How long does the battery pack last? If looked after correctly, tests indicate a peak life of 2000 cycles over 10 years, which is in the range of 200,000 - 300,000km depending on the size of the pack. During this time, its capacity (and range) falls by around 20%, but of course it remains useable in the bike or maybe recycled. The pack contains electronic management systems and is maintenance free. 15. Does the Čezeta make any noise? Practically nothing, there isn't even a drive belt to make noise, just the wind as you ride. For city use, use of the optional bluetooth speaker is useful to assist you alerting people to your presence. 16. Can I carry a passenger? Yes, it's a limousine scooter with a long saddle and running boards so there is plenty of room for a passenger. Where the law allows, ladies and Scottish gents may sit comfortably sideways on the rear to preserve their modesty. Rentals are available around Europe. If you buy, your rent is refunded.